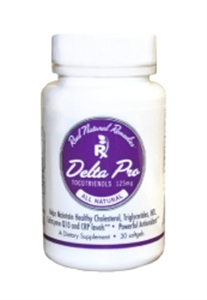 Delta Pro is an extraordinary new product to help promote cardiovascular health. This dietary supplement contains 125 mg of tocotrienols, made up of 90% delta fraction tocotrienol and 10% gamma fraction tocotrienol. It is an essential nutrient that can be used to manage bad LDL cholesterol, triglycerides, good HDL cholesterol as well as additional cardiovascular benefits as mentioned above. Tocotrienols are a part of vitamin E. Vitamin E is made up of 8 separate compounds. Four of these compounds are tocotrienols (alpha, beta, delta, gamma). The other four compounds are tocopherols (alpha, beta, delta, gamma). Tocotrienols are superior antioxidants to tocopherols. Furthermore, delta and gamma tocotrienols are the strongest of all Vitamin E compounds. This unique supplement contains only tocotrienols and no tocopherols because in order to experience the cholesterol affect, tocopherols must not be present. A product like Delta Pro has not been possible because of the costly extraction process and the presence of only trace amounts of tocotrienol in Vitamin E. Recently a groundbreaking discovery found that Annatto Beans contained 99% tocotrienol and no tocopherol. Now using this source from the Annatto Bean, Real Natural Remedies can offer an affordable dietary supplement featuring a high concentration of tocotrienols to support cardiovascular function. Delta Pro increases coenzyme Q-10 levels. Coenzyme Q-10 is a very important enzyme and energy catalyst which is used by our body to produce cellular energy. Having stable levels is an extremely vital component to living full and healthy lives. Cholesterol drugs are known to decrease coenzyme Q-10 levels. Delta Pro lowers CRP levels. This pertains to the inflammation within our bodies. Delta Pro improves insulin sensitivity. Low insulin sensitivity can become insulin resistance. Individuals experiencing insulin resistance can develop chronic obesity and other problems. Delta Pro is antithrombogenic. This means that it prevents clot formations in the arteries.